This was to have been North’s revenge year. The Roosters had been put to the sword by the Tigers in 1985 and ahead of the Big Replay, the Roosters’ Coach Michael Nunan (a man popular with Bay fans as a bubonic plague) stated that “we want to level the scores.” The North fans settled in the Spring sunshine of bleak Football Park, licking their chops and rubbing their hands, channelling Madame DeFarge, wanting to be in at the kill. Glenelg was not quite the same team as 1985. One young fellow*, who had been resisting overtures from VFL super-team Carlton for years, remaining coy till he could help Glenelg get a flag, had magnificently discharged his undertaking and gone East, to show the whole nation that he really was, as former Carlton President John Elliott once declared, “the greatest”. [*Stephen Kernahan]. And Magarey medallist Tony McGuiness, the fleetest and sharpest of feet, was gone too. These two men alone were enough to bolster any team, anytime, and they were sorely missed. Glenelg had lost 10 games during the year. No team had won a flag from there. Moreover, North was a terrific team and had improved after the 1985 season. It justly finished minor premier and was deservedly the favourite after beating us by a comfortable 4 goals in the 2nd Semi Final. While the northerners took a week off, Glenelg took Woodville down, the pitied and beloved and now defunct Woodpeckers (under Malcolm Blight) playing magnificently, beating Norwood and Port on the way to the Premiership Glory they would never attain, thanks to us. So, 1986 would be a showdown for the combatants of 1985. And thus the Bays had blood in their mouths…tempered by 5 Grand Final losses over the previous decade, they were in no mood for losing again, not after the high of the previous year. North and the rest of the State might expect and desire one result but then, Glenelg never gave a toss about what anyone else thought. Its self-belief and defiance would have impressed General de Gaulle himself! And so it proved. It was as if Coach Cornes had issued William-Wyler-style instructions: “Just…be better.” The team from Prospect was pretty good but the Bays monstered them and when the Roosters stopped rattling, they monstered them again. It was brutal, it was vicious…it was beautiful. And they put the chicken in the pot in the second quarter with the most dazzling display of Verve Clicquot football in experience. North were essentially destroyed in a holy trinity of goals. Straight after this, Alan Stringer gathered the loose ball in the centre, gave off to David Kernahan who kicked to half forward, where Hodgeman seized the spoils and handballed to Maynard, who kicked a beauty with his non-preferred foot. 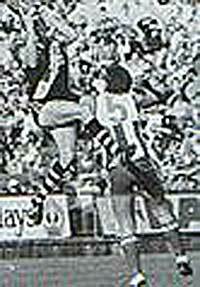 The Tigers were 6 goals up and on a blitz: then North attacked bravely, but Glenelg turned them away once and on the second occasion, Chris McDermott drove the ball back to centre wing, where Tony Hall took a screamer. From there, it was all downhill…for the Northerners. The fans were treated to a half-time ‘celebration’ of the State’s 150th anniversary that was certainly choreographed in Hell. In the latter stages, Stephen Copping laid a ‘slightly high tackle’ that Roger Carlaw won’t forget in a hurry. In the end, Glenelg won its second Grand Final in a row, scoring 21.9 to North’s 12.15. After it was all over, and in hindsight, or ‘looking through the high-resolution retrospectoscope’ as a friend once out it, you could say that this was the apotheosis of State football. It would never be the same, as the push had already begun to drag SA into a national football competition. Max Basheer, a true gentleman and President of the SANFL, spoke in the presentation and said that “our decision not to join the VFL in 1987 was not taken lightly.” You could see in his eyes a presage of doom. The Team: Peter Carey (C); Stephen Copping; Mark Donovan; Chris Duthy; Adam Garton; Ross Gibbs; Tony Hall; Wayne Henwood; Kym Hodgeman; David Kernahan; Robin Kidney; Max Kruse; Chris McDermott; David Marshall; Peter Maynard; Scott Salisbury; John Seebohm; Alan Stringer; Wayne Stringer; Tony Symonds. Coach: Graham Cornes.